Online Shopping: To Order, select the location and click "Add to Cart". If you want more than one map, just click "Add to Cart" for an additional unit. Paypal ensures a secure transaction using credit cards. Covers the Lower Kings River between Pine Flat Reservoir and Hwy 180 (E. Kings Canyon Road).Google map image showing topographical features. 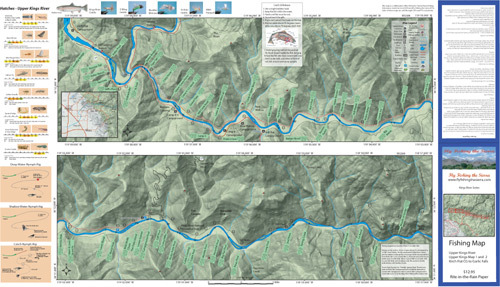 Sections of the river were identified with the assistance of Central Sierra Fly Fishing Adventures. Local guides, Fred Ramirez and Phil Davis, provided the location and names of specific sections with corresponding river structure. Also included is a hatch chart, mileage markers, road access, parking areas, nymphing rigs, Catch & Release Procedures, campgrounds, stream etiquette, and fishing regulations. Printed on Rite-in-the-Rain Paper that will allow you to write those special notes. Waterproof and Durable. 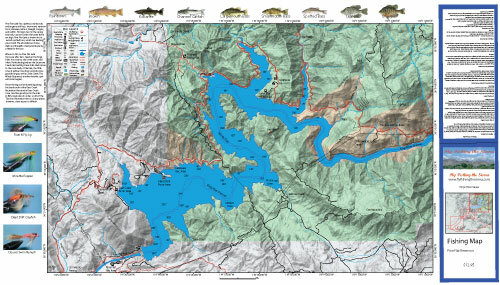 This map covers Pine Flat Reservoir. Map is still in progress. Available soon. 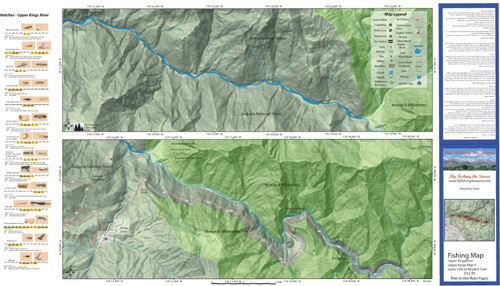 Covers the Kings River between Kirch Flat Campground and Garnet Falls.Google Terrain image showing topographical features. 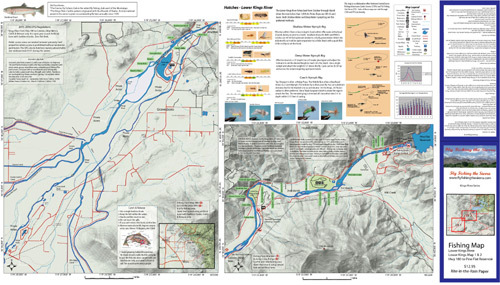 Sections of the river were identified with the assistance of Central Sierra Fly Fishing Adventures. Local guides, Fred Ramirez and Phil Davis, provided the location and names of specific sections with corresponding river structure. Also included is a hatch chart, mileage markers, road access, Nymphing rigs, Catch & Release Procedures, Campgrounds, Stream Etiquette, and Fishing Regulations. Printed on Rite-in-the-Rain Paper that will allow you to write those special notes. Waterproof and Durable. 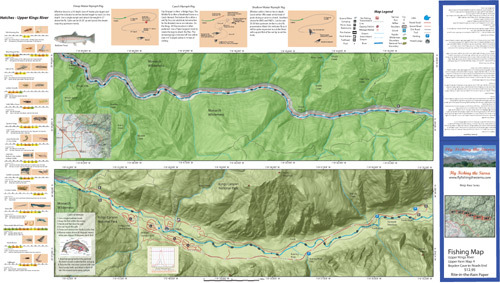 Covers the Kings River between Kirch Flat Campground and Garnet Falls.Google Terrain image showing topographical features. River Structures identified. Also included is a hatch chart, mileage markers, road access, Nymphing rigs, Catch & Release Procedures, Campgrounds, Stream Etiquette, and Fishing Regulations. Printed on Rite-in-the-Rain Paper that will allow you to write those special notes. Waterproof and Durable. Covers the Kings River between Boyden's Cave and Roads End.Google Terrain image showing topographical features. River Structures identified. Also included is a hatch chart, mileage markers, road access, Nymphing rigs, Catch & Release Procedures, Campgrounds, Stream Etiquette, and Fishing Regulations. Printed on Rite-in-the-Rain Paper that will allow you to write those special notes. Waterproof and Durable.